… is something still high on the university student wish list. Our own student daughter on her own cooking journey, would prefer a crock pot one of these rather than a sous vide, so we are investigating the best option. The crockpot is a simple tool, and seen as a nice slow cooker for meats and stews. It’s true that it is also cooking food for a lot longer but the temperatures can be higher than you would want for a sous vide, and not they also aren’t so easy to control. … in our view, is like the grown up more technical or professional upgrade to the slow cooker. Controlling temperatures, consistently, is the main feature. Without the precision, you can end up ruining your meal in a slow cooker if you leave it too long. You won’t ever dry the food out in sous vide, or end up with a mushy result that you can get if you leave the food too long in a slow cooker. The food cooked in a sous vide however perfect it tastes and healthy it is in content, some meats can look like a dog’s dinner until you finish it off by searing them. If you leave the food far too long in a sous vide also, the texture can change too. Some apps like the Joule app tell you how long it’s ok to leave the food for after the cooking has stopped. Cooking food in a vacuum is also a main element of sous vide and not for slow cooking, pressure cooking or instant pots. Without the vacuum sealing you are leaking all those lovely flavours ( and valuable nutrients) into that nice smell all over the house. In Sous vide the flavours stay within the food, so its the much healthier option. We’ve noticed that some people have tried to turn their crockpot into a sous vide machine but haven’t see any DIY solution be able to get the precision better than within 3 degrees. As well as the precision on a sous vide, its the range of foods that you can cook in it that makes it far superior to the slow cooker. you can’t cook sous vide stye eggs or desserts such as a creme brulée in a crock pot! Its not as precise as a sous vide. 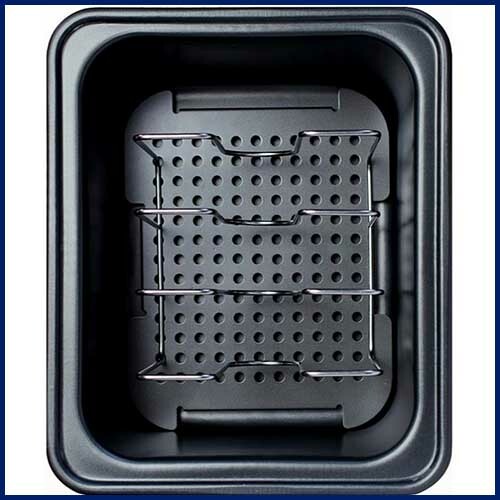 Heat and circulate water at the same time, which can be inconvenient at times, because they don’t include the necessary vessel and you have to find a suitable container for each cook. Having said that, they don’t take up much space, and can be put away easily. It’s also probably easier to empty the separate water vessel than most all in one water baths. When choosing one, consider what accessories you might need, and are they easily available already in your own home, or easy to buy. Provide both a heat source and the bath vessel all in one machine, which is more convenient. As a result though it’s less accurate. They also take up far more space in your kitchen, which is inconvenient if you like a minimalist look, or are already pressed for countertop or cabinet space. Do I need to buy anything else to get going? With an all in one water bath solution you don’t need anything other than the food bags. For an immersion circulator, you should just need a deep cooking pot, some resealable plastic food bags and off you go. At any stage, you can decide if you want to get a vacuum sealer or not, or a specific container, lid, insulating jacket for it. Extra clips, lids, magnets, carrying case etc etc. However to get started you don’t need these. Get going and see what you use your sous vide for, then add any sous vide accessories as you see fit. This determines the heating ability and timing. You will find the power in watts, and the higher the watts the faster it gets up to required cooking temperature… hence the faster the overall cooking time. You might think, ah well, its cooking for a long time anyway so what’e the difference, but you’ll think differently when you start using your sous vide regularly and you want to get that food into the pot to start cooking and on the table as fast as you can after a long day at work. If you are using sous vide to pre-cook different steaks for a dinner party, you will also want to get to the temperature quickly for each one. We love both the Anova Precision Control 900w and also the Chefsteps Joule, but speed of heating up is one of the reasons Joule is our winner. It’s twice as fast as the Anova. How consistent, and accurate is your sous vide machine. The best ones are accurate to within 0.2°F / 0.1°C. Accuracy is also measured in the increments you can set on your machine. 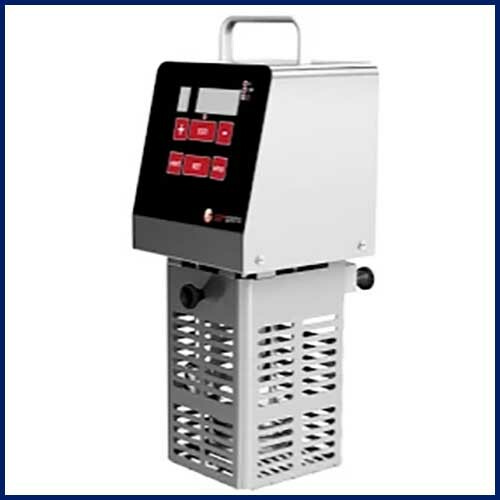 Our top picks for the Immersion Circulator can be adjusted to within 0.1˚C whereas the top water oven is within0.5˚C, and the entry level water bath can be adjusted in 1˚C increments. This is the water flow rate, measured in gallons or litres / minute. The immersion circulators tend to be more accurate than the domestic water baths. You may not think this is important but few degrees out can make a huge difference when cooking some things – eggs for example. 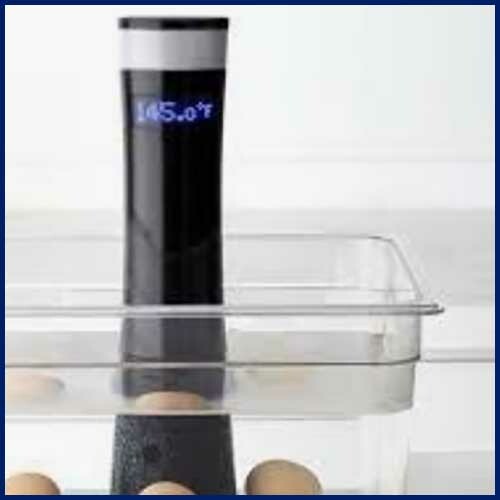 Have a look at our sous vide cooking times and temperatures advice to get a gist of cooking temperatures for various meats too. If you want to experiment with your cooking, you’ll want this feature. Water baths don’t all have pumps but the more expensive water baths either tend to have a circulator, or better technology to keep the cooking temperature even everywhere. At either end of the scale you tend to get what you pay for. The restaurant grade sous vide machines tend to be too expensive ( well over £500), industrial looking, or cumbersome for home use. In the middle, the most interesting area is between £150 and £300 ish,,, and this is where choosing one tends to get more difficult. So you need to know your own priorities in order to get the right one in this range. At the cheaper end, you are going to have to compromise more on build quality and maybe precision. Although as competition is heating up, the middle range prices can drop to a very affordable range around £50 to £75. Having it handy will mean you will use it more. So does that mean you want to have one on the countertop all the time, or one that will fit easily in a drawer? We have found over the years that until you get in the habit of using a kitchen appliance regularly, then if we don’t see it, we don’t use it! We also have a small kitchen so need things to be neatly stored away, or look nice and neat on the counter-top. We chose a small, lightweight wand so that helps when we take it with us as hand luggage ! It’s worth remembering that if your pod is heavy and large, you will need a larger water vessel too. Water ovens are self contained so for these really ease of use comes down to the display, controls, help with cooking tips, and how easy the cleanup is? 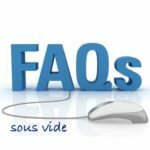 For immersion circulators, some food safe bags, and a bit of support with step by step recipes? The Sansaire probably has the best clip that is easy to snap on to any container. The Joules is a universal clip but you may have to buy the extra large clip for wide containers. however it also has an industrial strength magnet on the bottom though so you don’t need to use a clip at all. This is really useful when using smaller pans. ( If you aren’t using a magnetic based pan, just put a metal mat underneath your container so that the magnet works. ) The Anova has a clamp that is adjustable which is useful, though a little cumbersome. Do you need a special container, or can you get going quickly with cooking pots you already have? If cooking larger food more than 2 hrs be careful of evaporation…don’t let the water go below the minimum level. We found the Joule by Chefsteps had by far the best range with 1.5inches as a minimum too, that means we can even use a small saucepan! Is it easy to clean up afterwards? Actually, there’s very little cleanup with sous vide cooking. 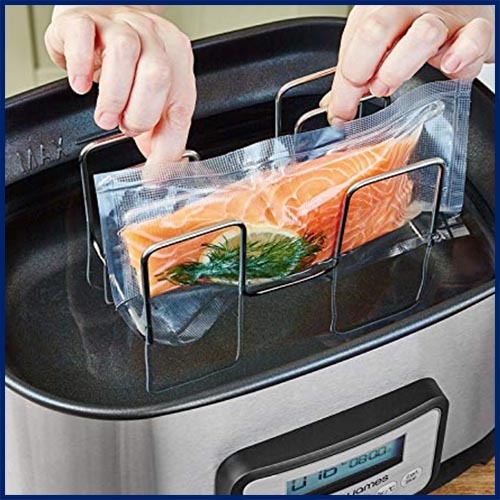 The receptacle of water holding the immersion circulator doesn’t need to be washed out and the water can be re used, so all you have to do is throw out the plastic bag the food was sealed in or wash it out if its a re-usable one. If you seared the food after sous-viding, it’s just washing that one pan. Finally how easy is it to operate. Are the controls intuitive? 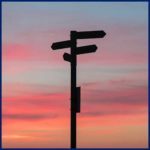 How do you connect with it – by bluetooth, wifi, or manual display buttons? The Anova and Sansaire win over the Joule on instrument display… because they actually have one ! The Joule has one light that changes colour depending on what part of the cooking stage you are at. The display per se is actually all on your IOS or Android smartphone, but it gives more step by step information and instruction ! With the smartphone connection however, you can get useful notifications all the way through your cooking. With Joule you can also use Messenger to ask about cooking times… We have found ourselves using that a lot in the planning stages because you can do it when you are out and about, and don’t even need to take your machine out of the drawer. Do you have to like it, or not mind as its just a technical tool ! Or, does the image have to go with your lifestyle, or kitchen decor. If you have a large or more practical kitchen, then maybe it’s not the main feature for you. Bluetooth is essential for the most modern immersion circulators. You can use this within 30feet / 10metres. Otherwise, you can use the internet and wifi to connect from anywhere and control your cooking. With some models you can also operate your sous vide hand free , by voice, through Amazon Alexa of Google home. Although you will find a difference in the ranges, they will all cover everything you need for for most domestic uses. Click over to our post on cooking temperatures to check temperatures you think you will need most. This is fixed of course with the water baths / ovens. 10Litres should cover most domestic use. The nice thing about the Immersion Circulators is that you can be flexible with the size of your water vessel. So if you want to sous vide a whole turkey or rack of ribs, you just need to have a container that it will fit into and off you go. Both Anova and Chefsteps have a fabulous reputation. Chefsteps is run by chefs and a recipe website and technology company that is devoted to sous vide. So their support, their app, and the step by step guides to cooking are second to none. 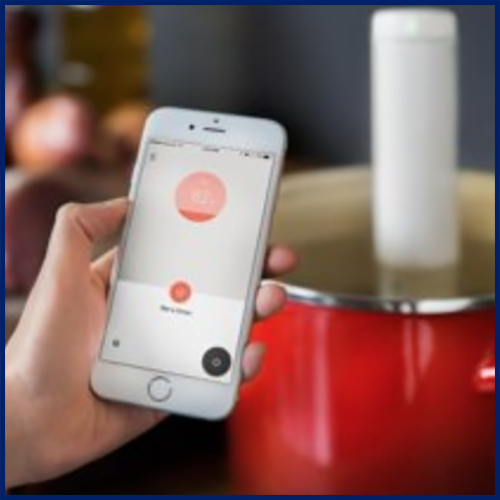 It’s visual doneness picture led cooking app makes it so easy to play sous vide! 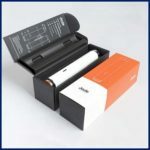 Anova is a laboratory equipment manufacturer with a solid reputation. They boast a database of 1000 recipes and the app has preset controls. This is one of our top recommendations. It’s the same as the SousVide Supreme water oven, but made smaller and cheaper for domestic users. Its incredibly quiet and energy efficient. Once temperature has been reached it only consumes the same energy as a 20W lightbulb! Also very robust, and comes with a higher price tag to match. You can also remove the rack and place larger bags directly inside. The sous vide supreme demi has a capacity of about 9L, and its more expensive big brother ( in silver) has 11L capacity. 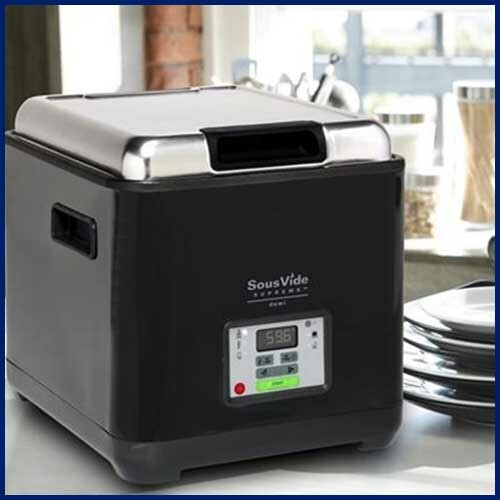 The SousVide Supreme water oven’s patented design and precision temperature control technology makes sure the temperature is kept even within an accuracy of 1°F (0.5°C), so there is no need for a pump to circulate the water. Showing the inside of the 8.5L (with 6L cooking capacity) Andrew James water bath ( similar to the Gourmia GSV138 in the U.S.) . This is great value for money, especially if you loo at the promo packs that include a vacuum sealer and bags too ! We wanted to show you this style so that you can see how they work, and how they usually look! A lot of domestic versions tend to have the lower end ‘cage’ as a solid piece now, with a hole for the pump to circulate the water. You can see here, how far the domestic style pods have come, design wise. This is quite futuristic looking, and about the size and weight of a full champagne bottle, so you are better off buying a plastic sous vide container to use with this one! The Joule is so sleek and small that you can use it even in a small pan that you already have. The support app, the flexibility with the great min. and max. water level range is one of the many reasons why we voted this one our very top pick (then bought it ourselves !). To be fair though, for a while, we weren’t sure whether to go for this or the Anova Culinary Sous Vide Precision cooker (seen here on Amazon UK, and here on Amazon USA). Both were right at the top of the wish list ! 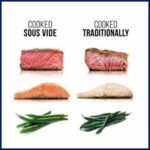 Have a little play around in the Amazon boxes below to see what sous vide offers you can get in the UK or U.S. today. Alarms… does your sous vide tell you when it reaches the cooking temperature, or when the power goes out, and restarts again? Some sous vide machines change display colours, or send an alert notification to let you know if this has occurred. Energy consumption / efficiency… this is important in a restaurant… is it important to you too? How well calibrated is your machine, if its a water bath is it easy to clean, is hard water an issue, so does it leak! Do you care ? 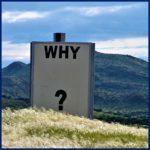 what unique features does your machine have, and do you need them? or would it just be so bleedin brilliant to control your machine through facebook messenger… or amazon alexa?